The kitchen is the backbone of any household; a place to gather and from where comforting food miraculously evolves. No, I am not the chef in our household but I do love kitchens, their design and the way they have changed over the decades. Once relegated to a separate room, kitchens were then opened up to become part of the family in open-plan living spaces. So where are kitchens going now? Unlike the Japanese, who build homes entirely without a kitchen because people work hard and frequent noodle bars, we still have kitchens – but they are disappearing. Where are they going? The new trend is for kitchens that ‘recede’ – they are still there and functional but form more of a backdrop than a feature. We still love open-plan living, we just don’t want to see dirty saucepans whilst enjoying our evening meal. So recessed kitchen design visually relegates the kitchen to the background with some designs providing areas to hide bench activity from view. A receding kitchen is great for smaller homes as it gives the appearance of space. And even if you have enough space, a receding kitchen draws the focus away from the kitchen and into the living area. So if you like the idea of recessed kitchen design, here are some facts you should consider. Choose a contractor with a reputation for attention to detail. Recessed kitchen design requires precise work. To give the appearance of receding, choose the same colour for all bench tops, cupboards and the splashback. You can vary the texture – for example, wood and metal – but ensure the colour is the same. Neutrals, chocolate, and white work well for a receding kitchen as they complement the seamless open-plan concept. Your choice of materials is important because you will have an expanse of space. For example, a white bench top with white cupboards and splash back is ALOT of white. Is that the modern look you want? Try wrapping the unit in paper or cardboard in the same colour you’re thinking about using, and see how that looks. Don’t clutter open benchtops with small knickknacks, canisters and bowls. The receding concept works best with one or two large ‘hero’ pieces and that’s ALL. Avoid bullnose – or rounded – corners as this will date your kitchen prematurely. Don’t overuse metallic surfaces; less is more. When budgeting, buy the very best tap-ware and stove you can afford as these items will set the ‘tone’ of your new kitchen. Consider the height of your overhead cabinets. The kitchen will look more streamlined if the cabinets are shy of the ceiling, but that will create a dust trap. Cabinets that are flush with the ceiling can look bulky, so consider what will suit you best. Think about the time of day in which the kitchen will get the most use and decorate accordingly. I also found this interesting kitchen design (below) which I thought you might like. By using the open shelves to delineate between kitchen and dining, it does diminish the impact of the kitchen from the living area. I love this idea, although open shelves do attract more dust and cooking ‘debris’ so be prepared. Are you a fan of recessed kitchen design? Are you thinking about it or have you lived with it? What are your thoughts? 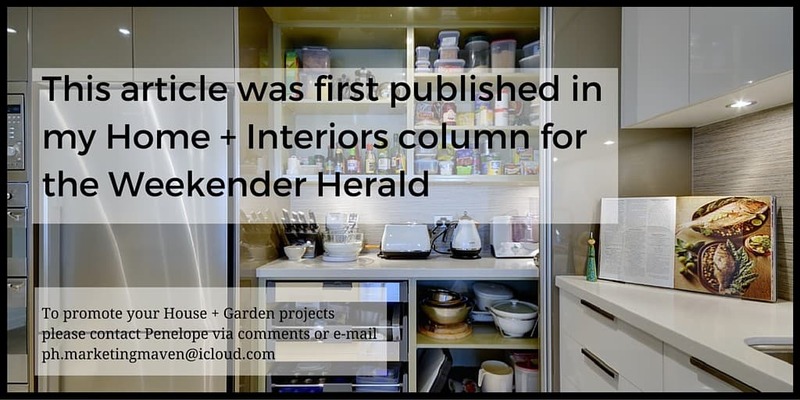 You might also like to read about colourful kitchen appliances, expert kitchen design tips, cleaning your kitchen with bi-carb, and the wonderful Zwilling professional kitchen knives.